July 1999 – January 2000: Resident in Internal Medicine, 2nd Department of Internal Medicine, 401 General Military Hospital of Athens. March 2000 – June 2001: General Doctor in Health Care Unit of Angiofillo, Kalampa-ka/Trikala (Compulsory civil service). June 2002 – March 2004: Resident in Internal Medicine, 2nd Department of Internal Medicine, 401 General Military Hospital of Athens. March 2004 – July 2004: Observer in Heart Failure Unit, 2nd Department of Cardiology, “Evangelismos” General Hospital, Athens. July 2004 – July 2008: Resident in Cardiology, 1st Department of Cardiology, Hellenic Red Cross Hospital, Athens. October 2008: Certified cardiologist, Prefecture of Athens. Certified in the Cardiac Pacing and Implantable Cardioverter Defibrillators (ICDs) of EHRA (2012). Participation in Interventional EP Curriculum, SVT Module (2011-2012) organized by St Jude. PROCTORING SERVICES (2013-2014) IN MEDTRONIC FOR BIVENTRICULAR SYSTEMS (CRT-Ps and CRT-Ds). Participation in Interventional EP Curriculum, AF (ATRIAL FIBRILLATION) Module (2013-2014) organized by St Jude. Participation in “NEW TO LEFT” PROGRAMM, organized by MEDTRONIC (2015) for CRYO-ABLATION OF ATRIAL FIBRILLATION. EHRA Accreditation in Cardiac Pacing. Doctoral thesis (grade: excellent) on “Sleep Apnea Syndrome and Chronic Systolic Heart Failure. The Impact of non-invasive ventilation on left ventricular remodelling”, Medical School, University of Athens. 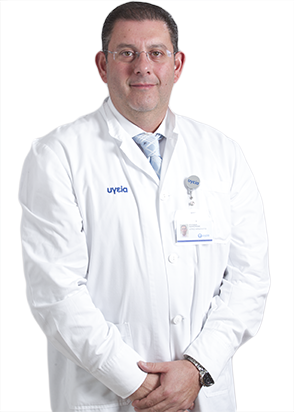 October 2008 – July 2012: Private cardiologist – electrophysiologist in Henry Dunant Hospital of Athens. During these years, I have participated in about one thousand and five hundred procedures for cardiac rhythm devices (1000 pacemakers, 400 ICD’s and 100 CRT’s) and about two hundred and fifty ablations (including complex arrhythmias such AF, VT and left atrial arrhythmias’ ablation). July 2012 – February 2015: scientific fellow 1st Department of Cardiology of Red Cross Hospital, Athens. Participation in four multicenter studies (BEAUTIFUL, HERCULES, SIGNIFY, ROCKET-AF) and, additionally, in five more studies. October 2008 till now: Private office. 2013 till now: EP, PACEMAKER and ICD Unit, HYGEIA HOSPITAL. Participation in Arrhythmias Lectures for cardiology residents, the last four years, organized by Hellenic Cardiologic Society (HCS). In Electrophysiology and Heart Rhythm Management Devices as well as in heart failure. Sleep apnoea syndrome and chronic heart failure. New oral anticoagulants (NOACs). I have participated in the translation and publication of several cardiology books (e.g. Hurst’s “The Heart”, E. Braunwald/Goldman, “Primary Cardiology”, E. Braunwald, “Atlas of Echocardiography”, “Atlas of Electrophysiology”, “Atlas of Heart Failure”, “Atlas of Cardiology”, Secrets of Cardiology, Manual of Echocardiography etc) as well as of some series of medical journals (e.g. “Harvard Heart Letter”) in Paschalides’ Hellenic Medical Publications.